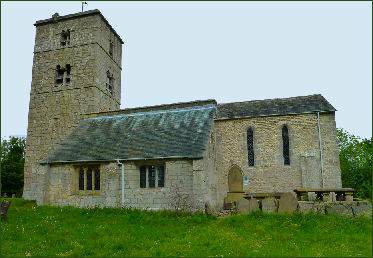 All Saints is a beautiful Grade 1 listed Saxon church in the small village of Appleton-le-Street on the edge of the Howardian Hills of North Yorkshire, situated around 3 miles (5 km) to the west of Malton. Looking out over the Vale of Pickering, the building managed to escape the worst excesses of Victorian restorers. A pre-Christian temple may have formerly occupied the site, while the Romans once had a burial ground here. The first written reference to a church at Appleton dates from a twelfth century charter issued by King Henry II, when the church was owned by St. Alban's Abbey. The building has one of the finest Pre-Conquest towers in the north of England. Its two lower sections date from the first half of the eleventh century, while the top section is a later, Norman addition. In the sanctuary are two fourteenth century effigies of members of the Boulton family (pictured below right). The effigy to the north of the altar has two heraldic shields on her robe bearing the Boulton arms. This figure dates to the latter part of the thirteenth century and may depict Alienore de Boulton. 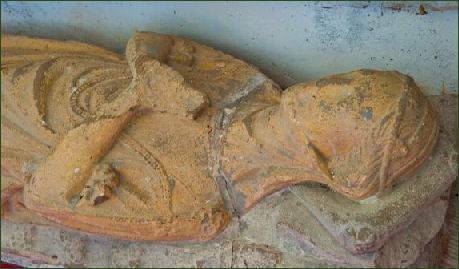 The second effigy dates from the first half of the fourteenth century and may be that of Hawise de Boulton, mother of Sir Thomas who founded the chantry, and daughter of Alienore. An alternative interpretation is that the figure represents one of Sir Thomas's two wives, Alice de Boulton or Clementia Constable. The interior of the building also boasts a simple Norman tub font. The tower arch is Norman, while the nave arches are Early English, dating from 1175-1200, when the north aisle was added. A south aisle was added about 1300, and a chantry chapel was founded by Sir Thomas de Boulton in 1346. A piscina in the south suggests the location of the De Boulton chantry. The small section of stained glass at the top of the east window depicts the arms of the Greystock family, owners of Henderskelfe, now Castle Howard. This is the only fragment of medieval glass in the church and dates to the thirteenth or fourteenth century. Access is via a footpath from the main road,or, better, follow the lane down the side of the Cresswell Arms pub and turn right, following signposts to the church. Car parking is available in the designated area of the churchyard, which is managed as a conservation churchyard.